Fireclay Bricks or fire bricks are the most widely used refractory bricks because of their great features: low thermal conductivity; good thermal insulation performance; high resistance to thermal shock, abrasion, chemical attack to provide long service life; easy operation and installation; broad usage and applications; and low price, etc. At KT Refractories we offer a comprehensive range of Fireclay brick/fire bricks consisting of 30-55% alumina, all of which exhibit excellent strength. View More In Ceramics & Glass. If you have any questions about this product by KT Refractories, contact us by completing and submitting the form below. If you are looking for a specif part number, please include it with your message. 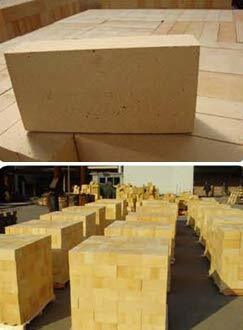 KT Refractories Insulating Fire Brick 2800F 2.5"X4.5"X9". Macor, MAC2-020202, Machinable Ceramic Sheet, 1/8" Thick X 2" X 2"
Alumina 96%, AS1-95, Fully Fired Ceramic Substrate Sheet, .080" Thick X 4 1/2" X 4 1/2"